DOHA, Qatar — Early next week Qatar hosts its third career fair in a year to “empower Qatari women in the nation’s workforce.” This is an Islamic Arab nation that thinks of itself as a relative haven of fairness for women, some of whom hold significant posts in philanthropy, education, and human resources. The event’s organizers note in their promotional materials that Qatar ranks ahead of its Gulf coast neighbors in encouraging women to embrace work in the public realm. Yet compared to the overall size of Qatar’s labor force, which government statistics put at just under 1.6 million workers, Qatar’s 87,000 native working age women hold just 27,500 jobs. Qatar’s 84,600 men of working age, for that matter, hold just under 57,000 jobs. Taken together, men and women, Qatar’s native born working age adults hold about two percent of all the jobs in this nation. Still there is no disguising the purposeful distance that Qatar culture builds into the lives of its women. The workforce career fair will be held at the ladies campus of Qatar’s Community College, and is open solely to women. During the week I’ve spent in Qatar, my first visit to the Gulf region, the questions I’ve been nervous to ask are those that concern culture, especially the patriarchal system and traditions that describe the roles of men, and the presence of women in public. What I learned is far from the complete story, but it’s a start. 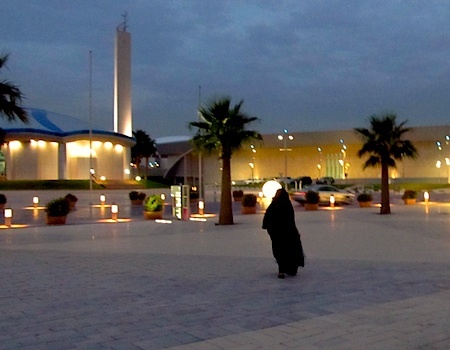 Qatar women cloak themselves in black in public, honoring the traditions of their Islamic culture, and the constraints and norms defined by a society that treats men in public as clearly the superior gender. The black robes and dark veils also serve to bind the culture together, forming a distinct tribal identity that authoritatively declares Qatari women as separate and apart from the emigre women here, who dress in Western clothing and are much more numerous. It is illegal for a non-Qatari woman to wear the black robes except if they come from other Gulf nations where the robes are part of their daily dress. The black robes also form a protective barrier for women, I was told, to fend off the advances of rapacious adult males. The separate and apart female culture here is supported by institutional safeguards. There are separate elevators for women, separate cafeterias, and separate campuses in public and private institutions. Young Qatari women travel in groups in public and during my week here I rarely saw a robed Qatari woman walking alone outdoors. Nine years ago Qatar approved legislation to require equality in worker rights and career advancement for women and men. The country is encouraging Qatari’s women students to pursue careers in science, medicine, education, government and law. I was told by several people here that in many of the universities now located in Doha, including five campuses overseen by American universities, and another overseen by the Canadian College of the North Atlantic, Qatari women outnumber Qatari men in enrollment. A 2008 Rand study found that, on average, Qatari women are better educated than Qatari men, and that Qatari women were the fastest growing segment of the nation’s workforce. I learned almost nothing here about the lives Qatari women lead in private. Families are smaller than they once were. Typically, married couples have two or three children. Two generations ago, Qatari families typically had seven children or more. Divorce rates hover near 50 percent, just like in the West. Qatari mothers raise girls hidden by robes and veils here, but those same young women head to universities in Europe and the United States to train as doctors and scientists. Boys grow up here with toys, especially fast and expensive cars. The high octave rev of powerful engines — Ferraris, Lamborghinis, Maseratis, Corvettes, and BMWs — form the soundtrack of Doha evenings. The country’s way of life now also is proving dangerous to Qataris, where rates of diabetes, high blood pressure, and obesity are among the world’s highest for women and men. Amid all of these signals of wealth, privilege, distress, and distance I learned about one more. Qatar and its Gulf neighbors form the largest per-capita market for cosmetics and personal care products in the world. The high volume sales of beauty care products seems to signal that when the robes and veils are thrown off, Qatari’s private culture must get pretty interesting.